Untouched pictures sent in of REAL results from a satisfied customer! I've seen an ad on T.V. showing a male model applying Plexaderm under his eyes to remove bags. Since I have horrible bags that are due to hereditary and age (I’m 54) I thought maybe I would try it before I make an appointment for injections. Then i thought ... no this is just another gimmick. 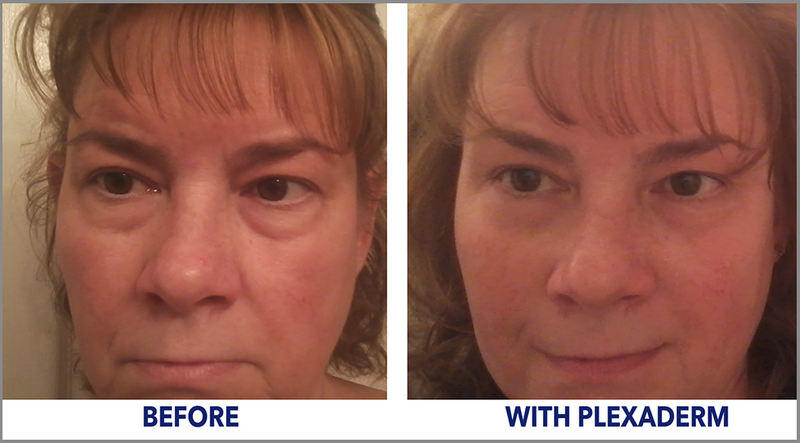 (I had already tried Sudden Change all that did was push my bags to the side which created more wrinkles...not sure which was worse) Well after about 2 weeks of constantly seeing the ad for Plexaderm, I thought I don't have anything to lose since it's a Money Back Guarantee... So, I ordered a bottle. I must admit it took me a couple of days to even open the box since I already prepared myself to be disappointed.